What is the ICB Portal? The ICB has a Student Portal which lets students manage their profiles directly with the ICB, by going online. As an ICB student, you can do the following things on the ICB portal. Username – this can be any name of your choosing. Password – this can be any password of your choosing. Email – your personal email address, which ICB will use to communicate with you. As new learner to ICB, you will be required to register/update your personal and contact details to ICB’s database. Once you’ve completed this process you will be able to enroll yourself for exams with the ICB, which will make available your ICB portfolio and assessment material. Where do I log into the ICB Portal? It’s simple! 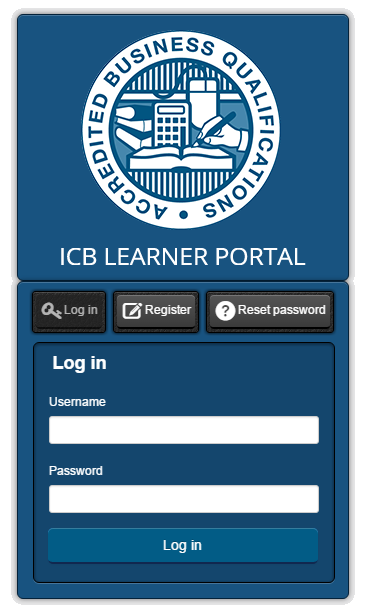 You can just follow the link here: ICB student portal login and enter your details and you can start using the ICB learner portal. You will find a screen that looks like the image below. Then you will just need to enter your details and you can start using the ICB student portal. If you want to read a more in-depth guide to this fantastic tool you can do so on this page.